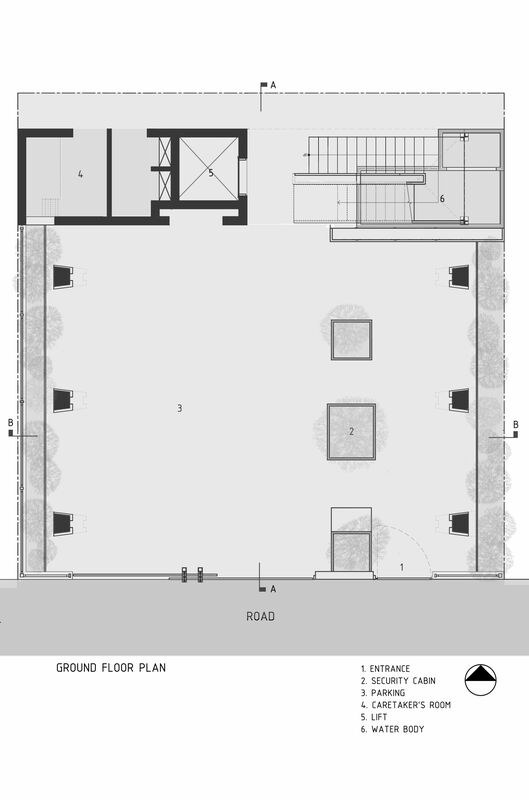 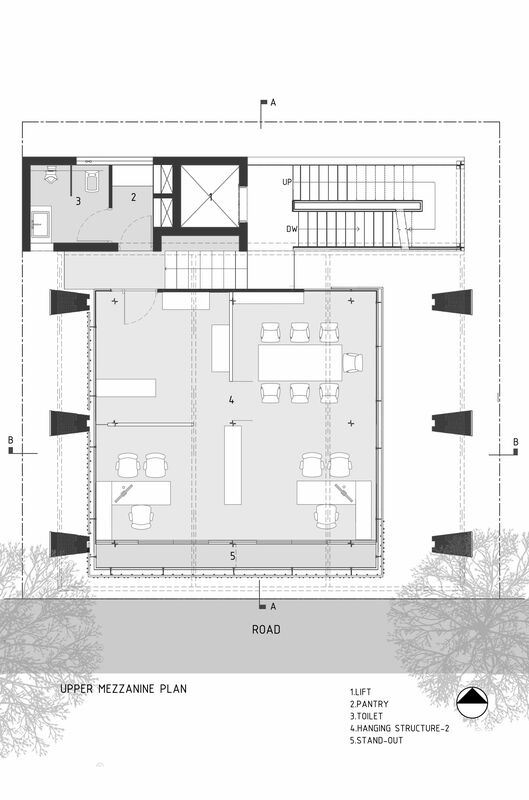 Building an office and studio for one’s own architecture practice is a challenging and an exciting prospect at the same time. 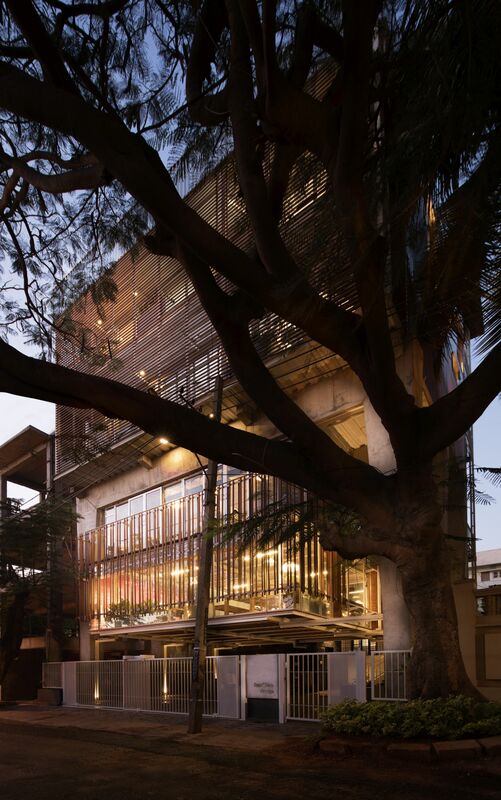 When Funktion Design set out to build their own studio, they wanted to bring to the fore, a strong conceptual ideation and structural exploration that they have hallmarked in all their projects to date. 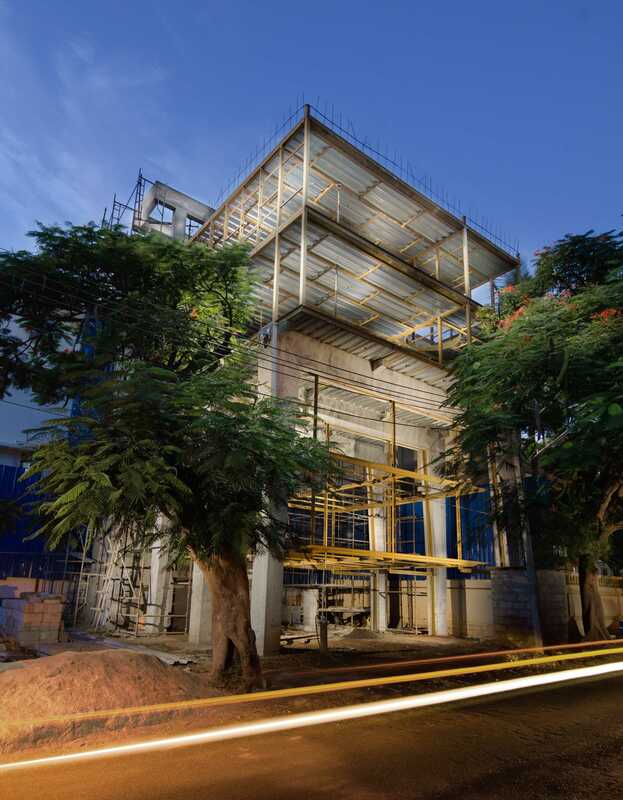 The layout accommodating Funktion Design is a South facing site, 40 feet x 40 feet in dimension and located in a bustling residential area of Sanjaynagar, Bangalore characterized by dense low rise housing with very little distance between adjoining buildings. 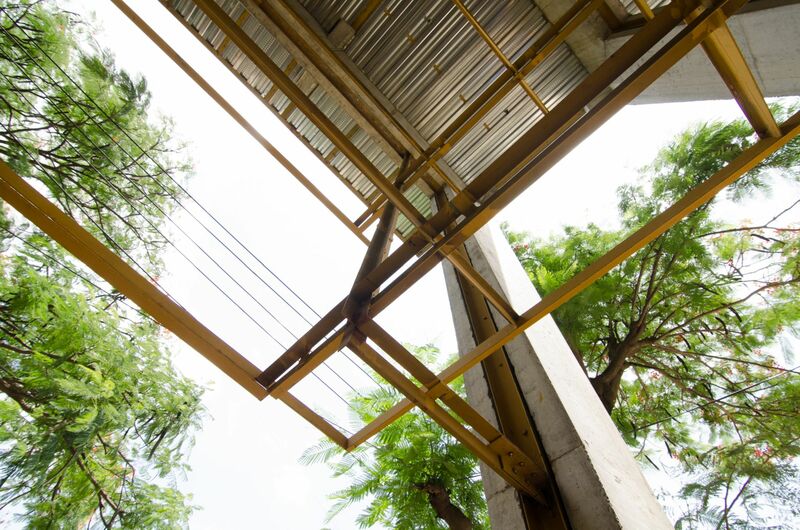 The site is skirted by two voluminous Gulmohar trees along the road canopying at around 9-10m from the ground and offering their woody charm to an otherwise concrete neighbourhood. 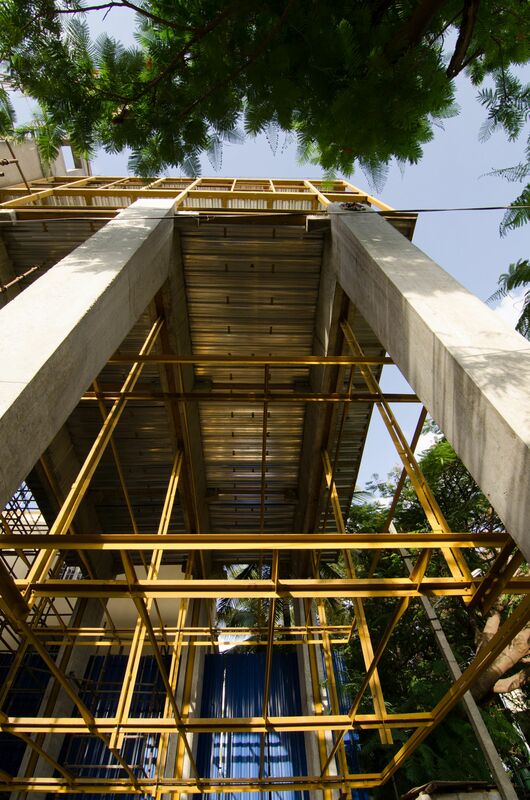 The best light and ventilation is available in the upper reaches of these high-density sites. 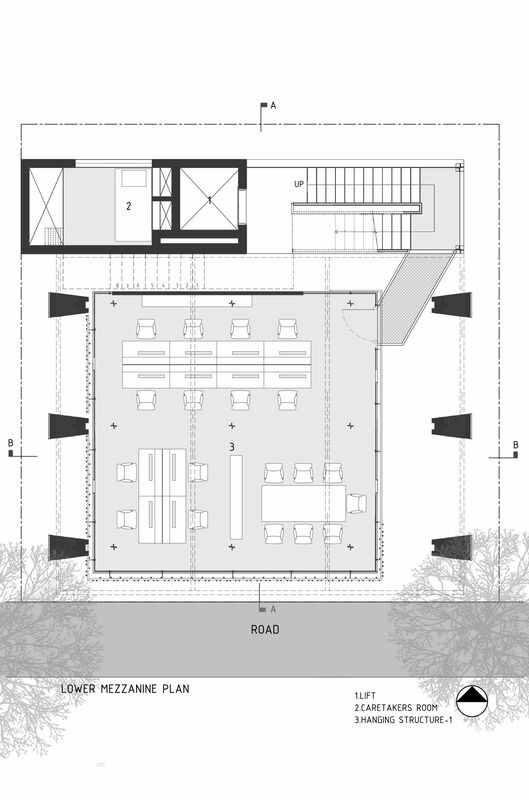 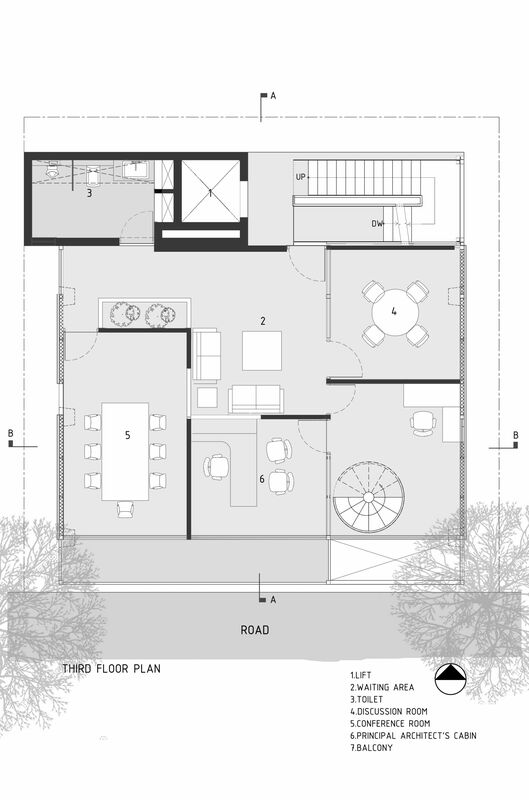 The design strategy therefore evolved as a response to this site context as well as a reinterpretation of the program of an architecture office typology. 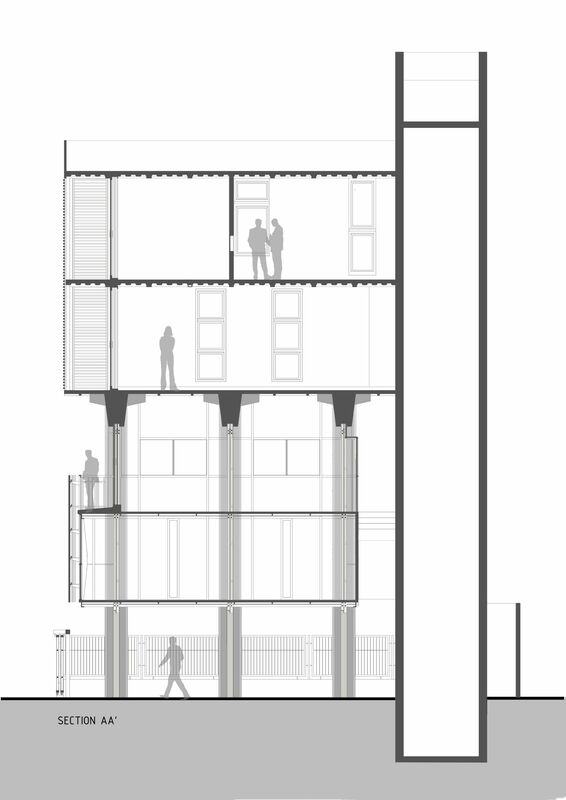 The office spreads across the top two floors of the building. 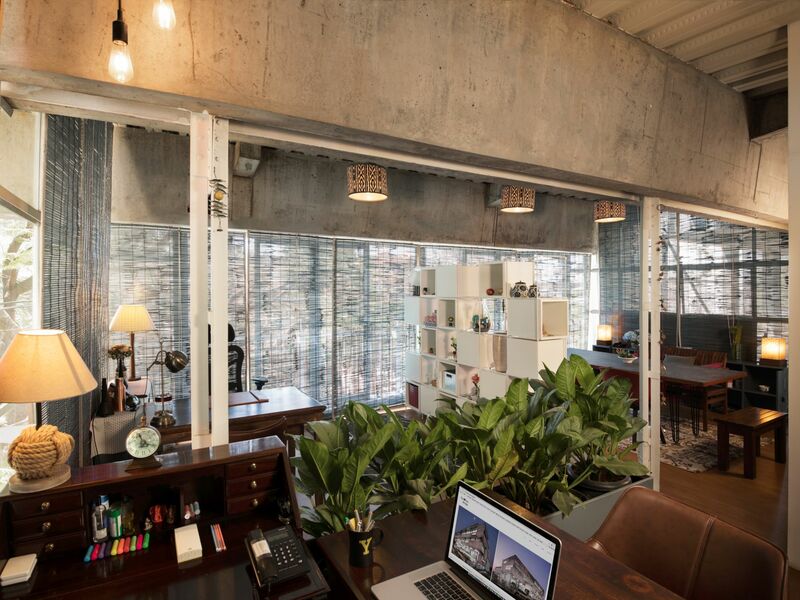 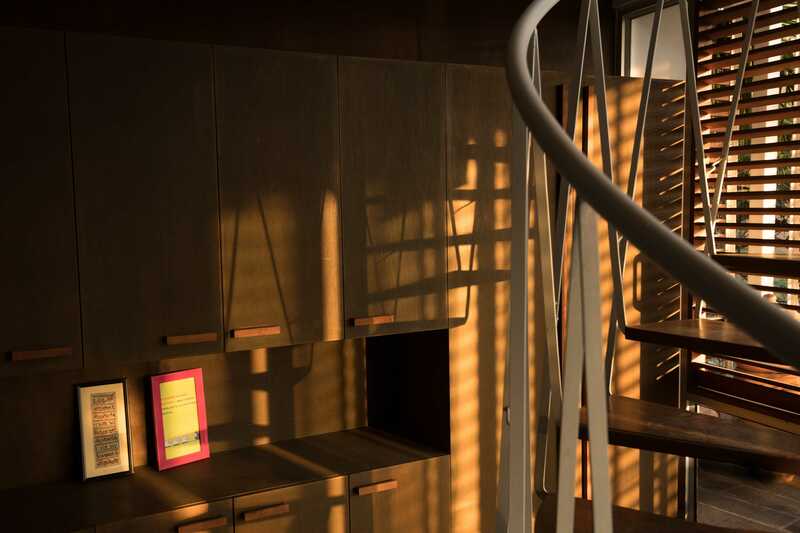 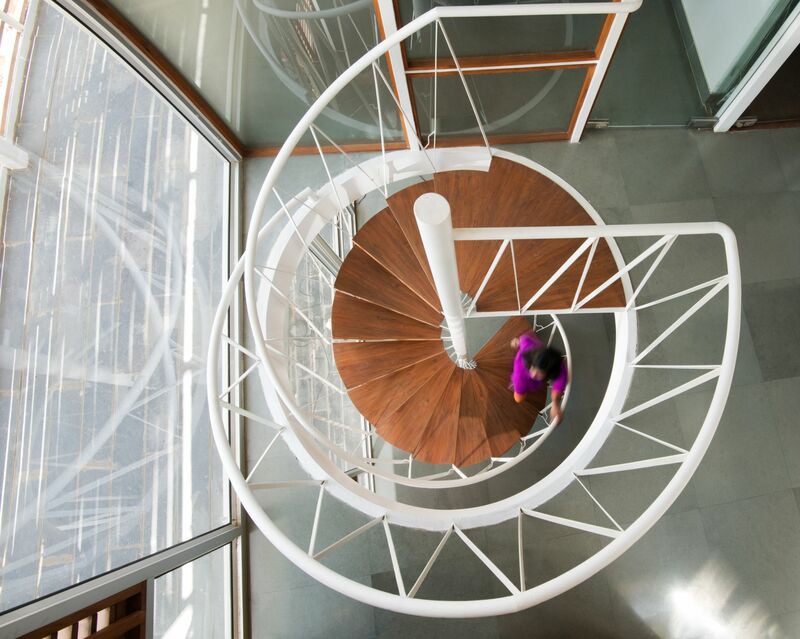 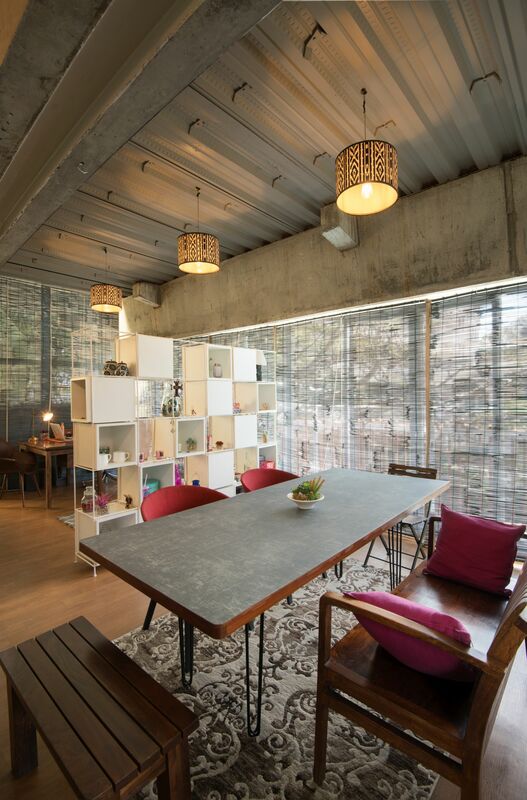 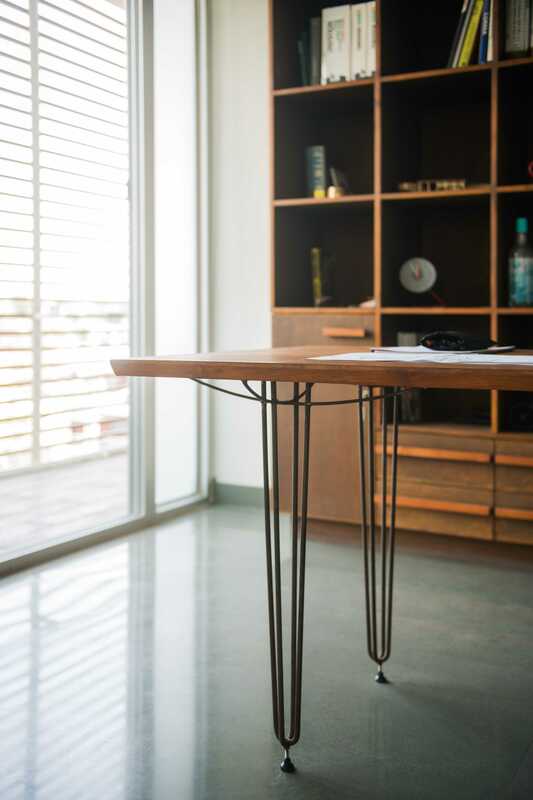 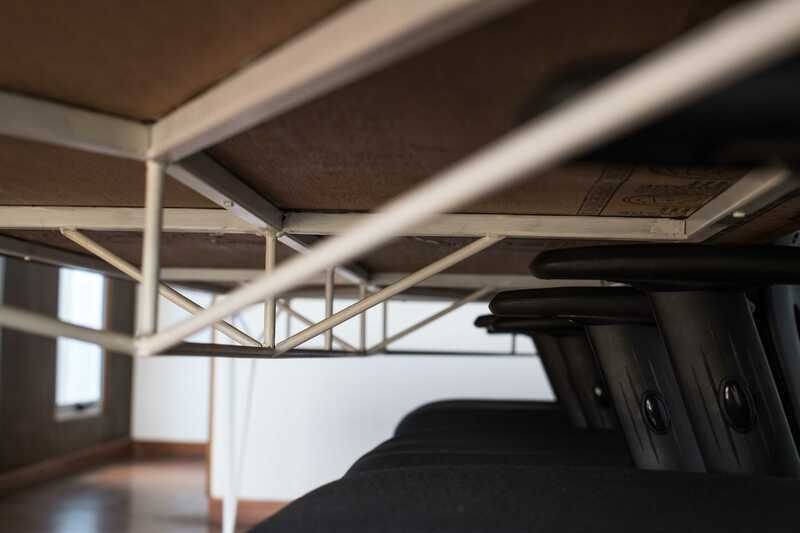 The top most floor comprises of meeting rooms, conference hall and reception that essentially forms the public face of the studio; and the floor below embodies the studio workstations aligned fascinatingly in level with the Gulmohar canopy outside. 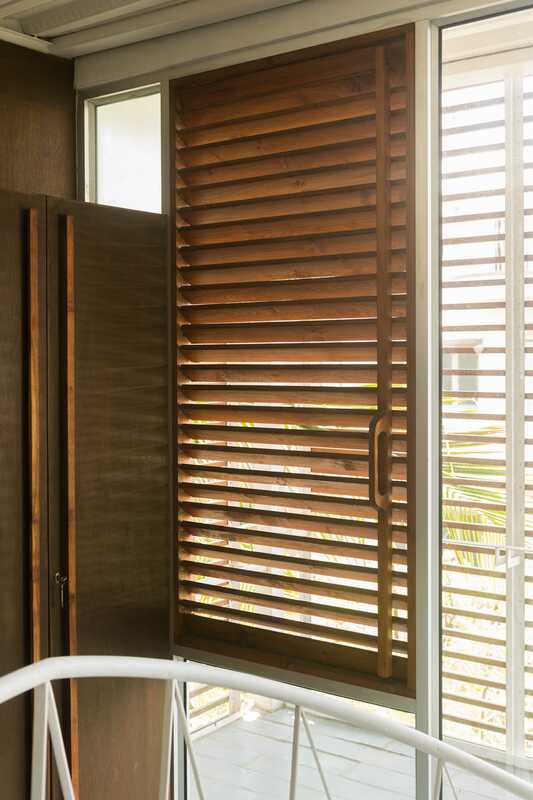 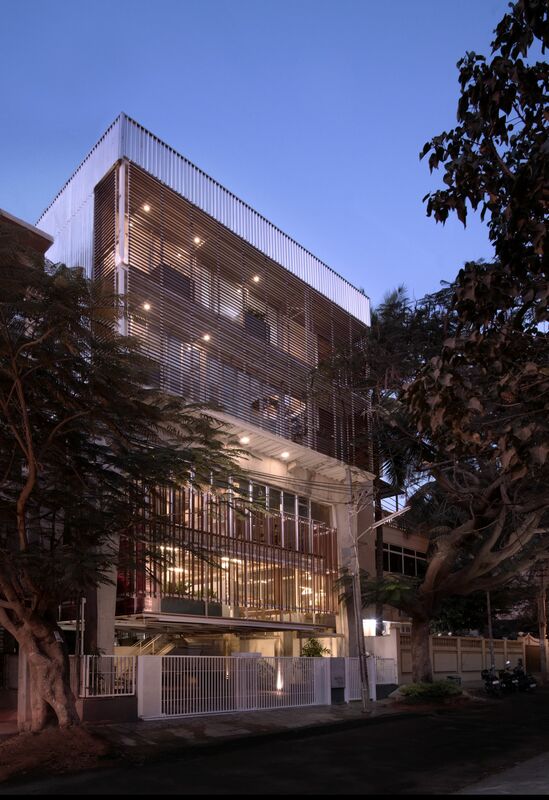 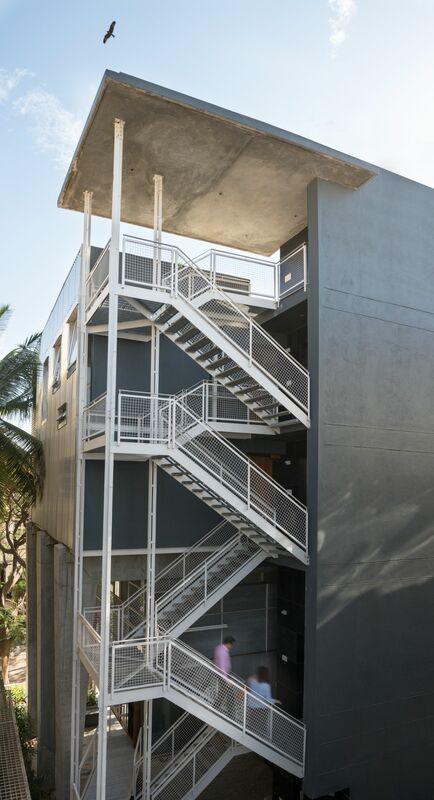 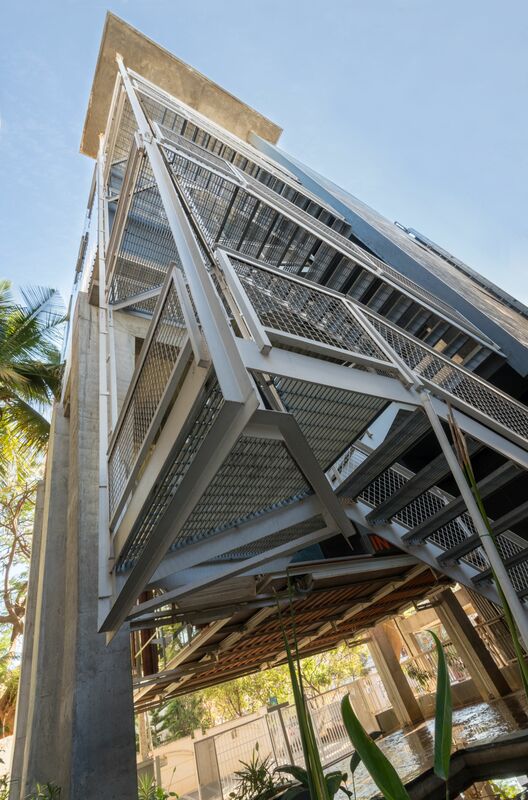 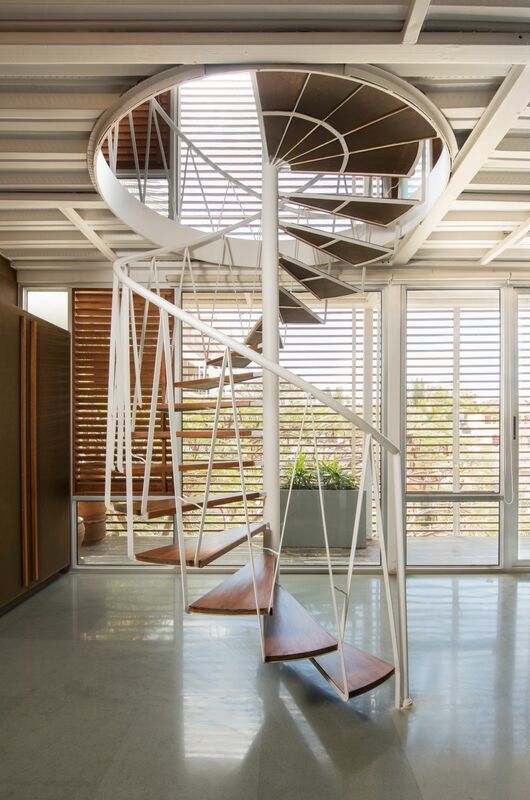 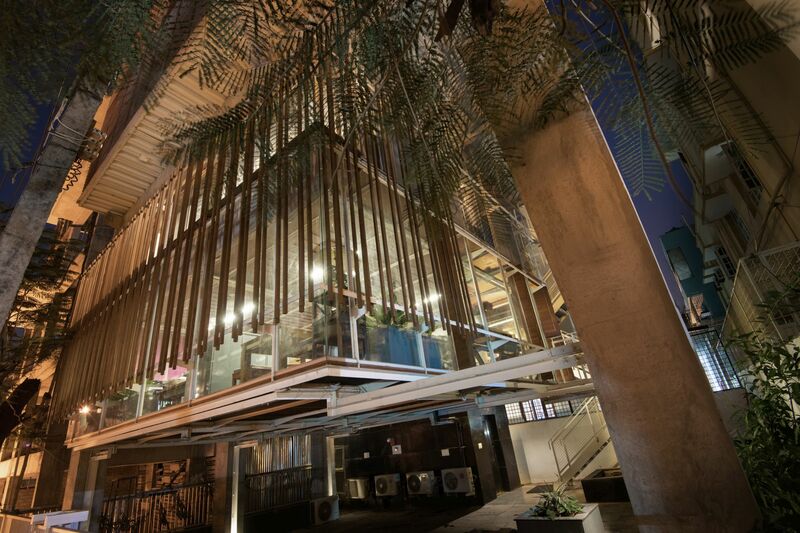 These two floors are expressed as a large aluminum-clad box placed on a concrete portal at an 8m level and open out into long balconies (facing the road) with recycled teak wood louvers to cut off the harshness of the South Sun. 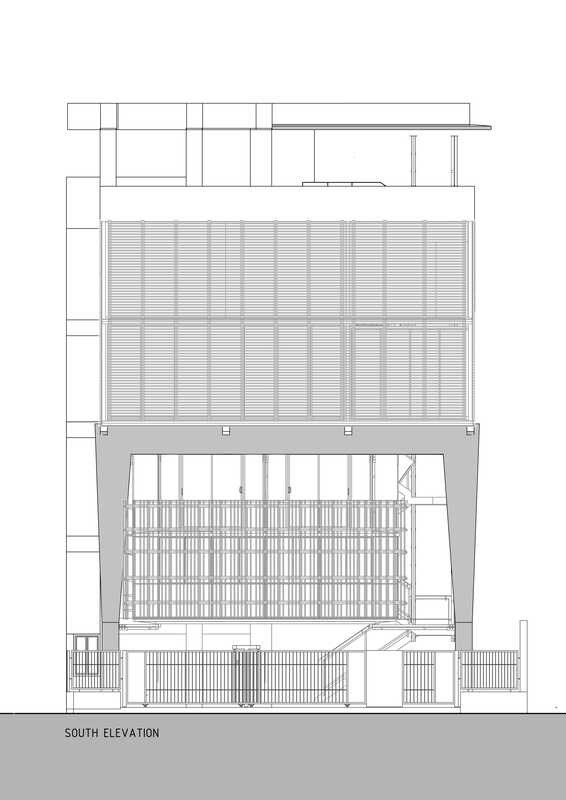 At the level below, hangs a glass-walled re-adaptable plywood floor mezzanine suspended from the concrete portal, which currently is being used as an art gallery. 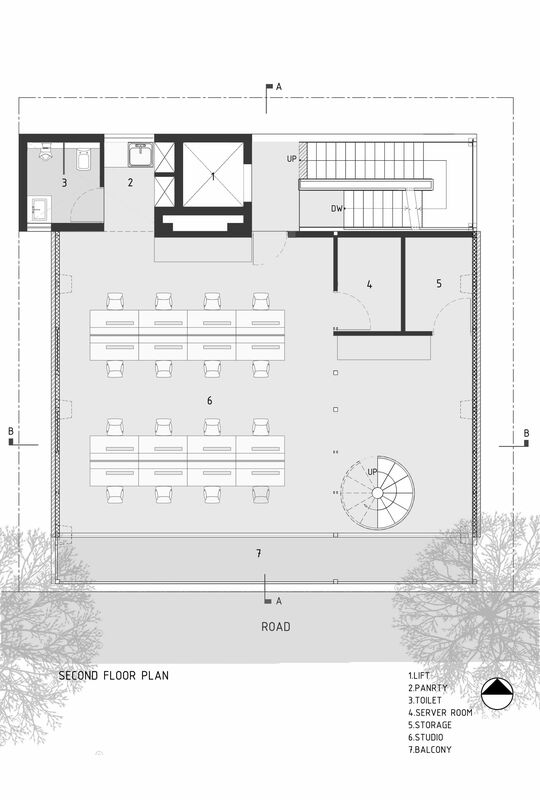 This social space still remains in pipeline for future expansion. 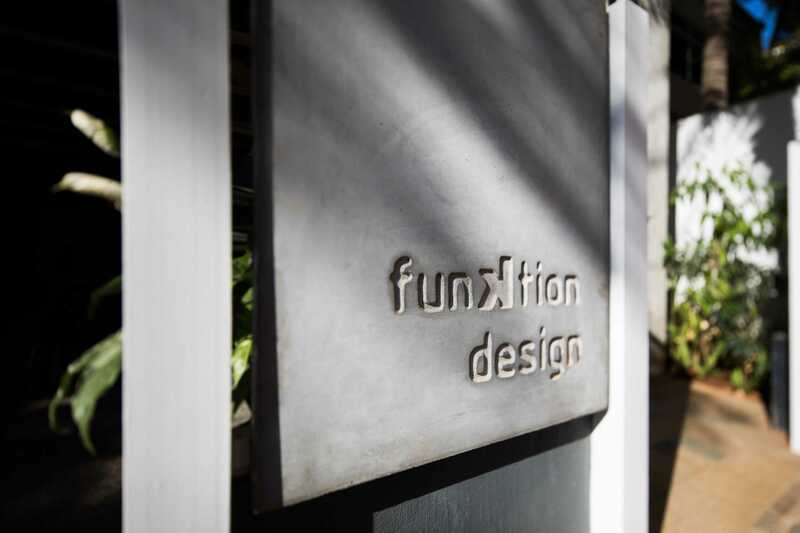 Funktion Design is an expression of an interesting structural language. 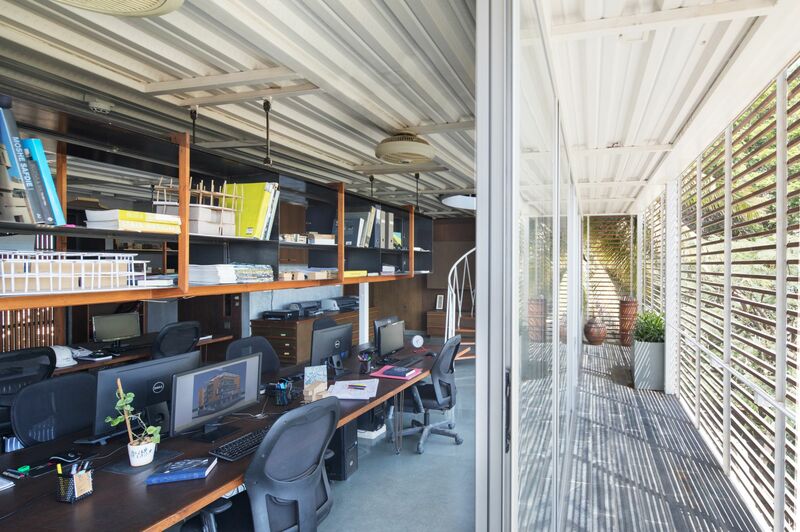 The main supporting structure is casted by three 9m x 8m concrete portals on which three steel portals form the framework supporting the steel deck roofs of the studio level and the meeting zone. 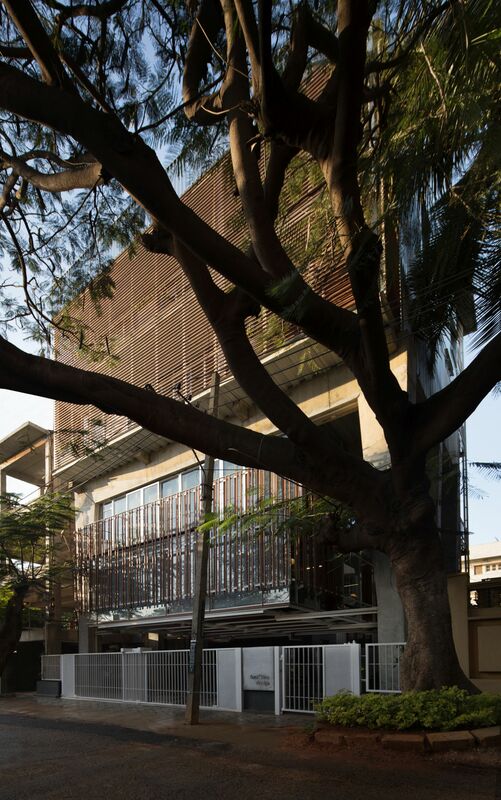 The mezzanine gallery suspended from the concrete portal is expressed to look like a translucent lantern covered with vertical wooded louvers that act as a climate screen. 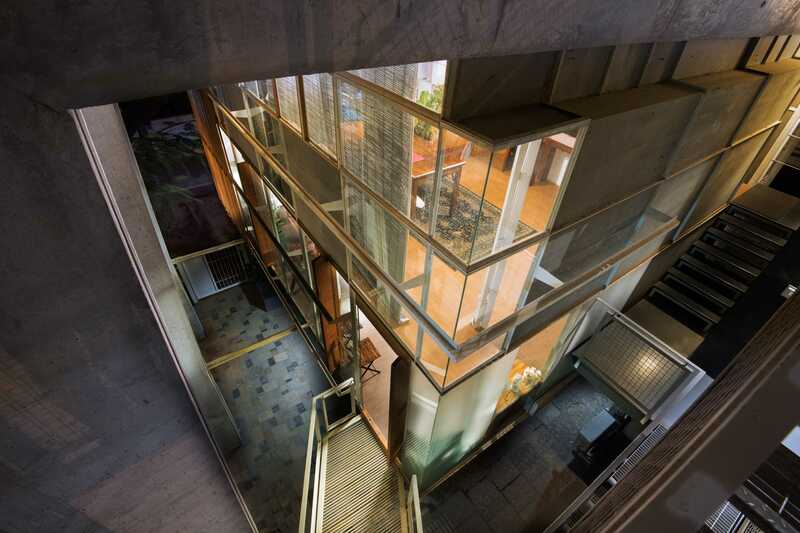 The three large concrete portals reminisce the structural expression of brutalist masters of the 60s. 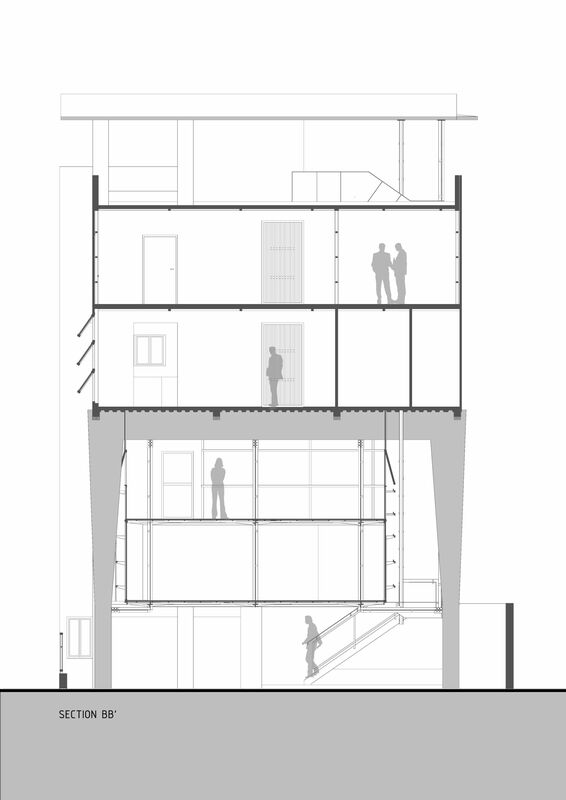 Widening at the top and tapering in all three dimensions gives the audience the impression of an animal’s limbs. 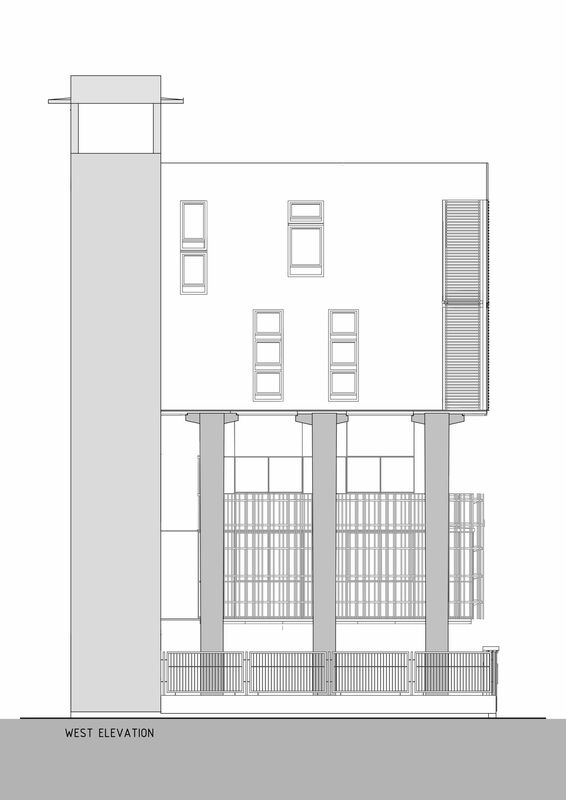 The subtle changes in dimensions along the cross section render an ingenious delicacy to an otherwise large scale. 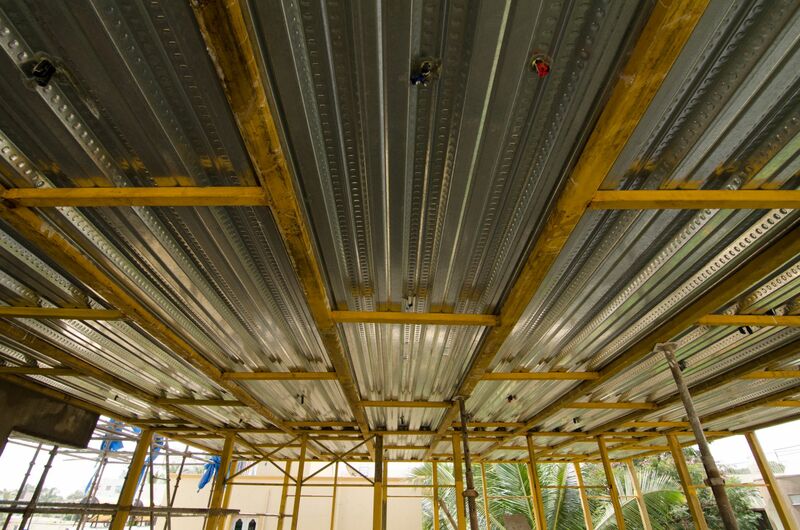 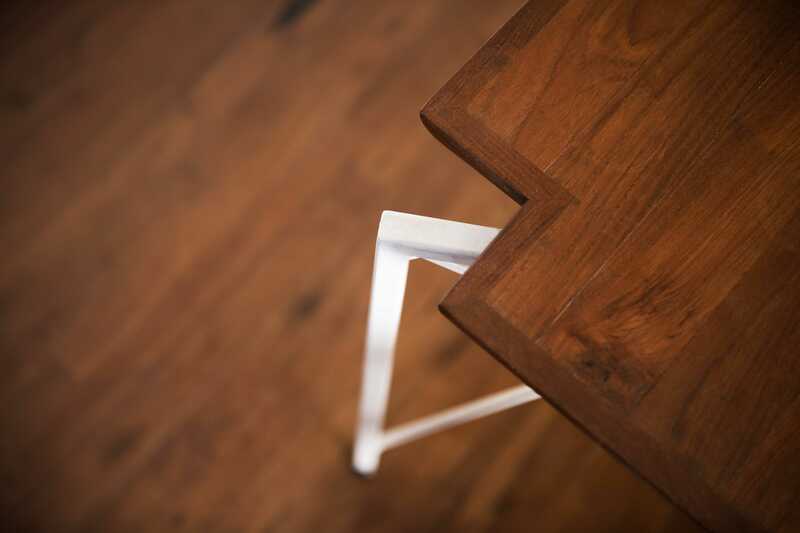 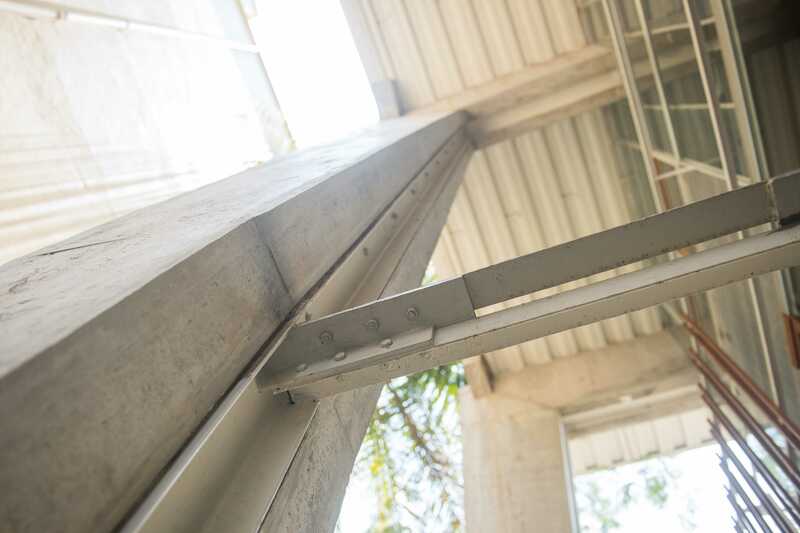 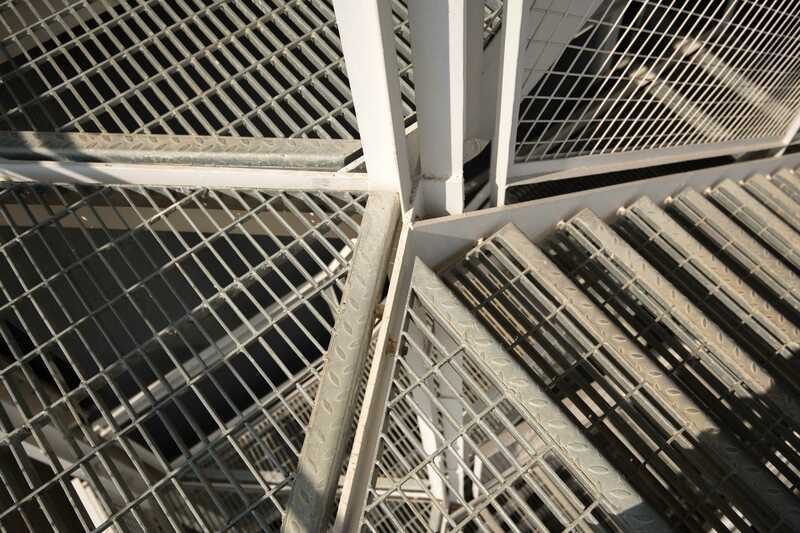 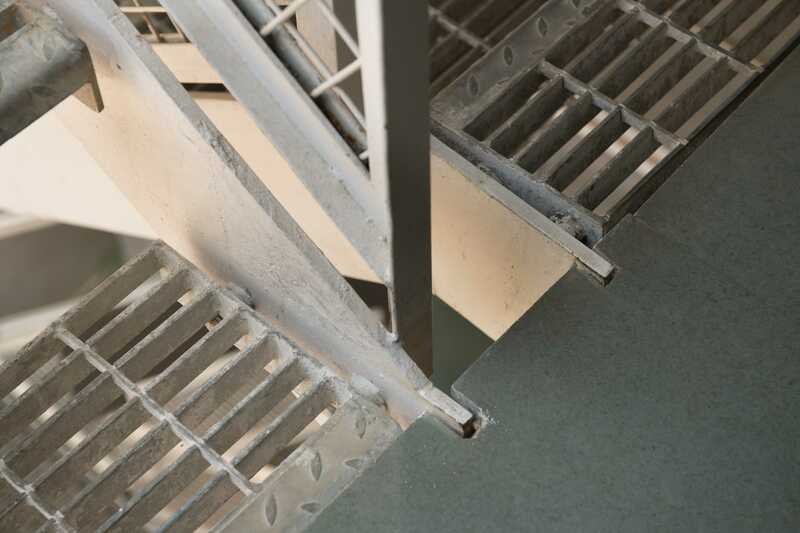 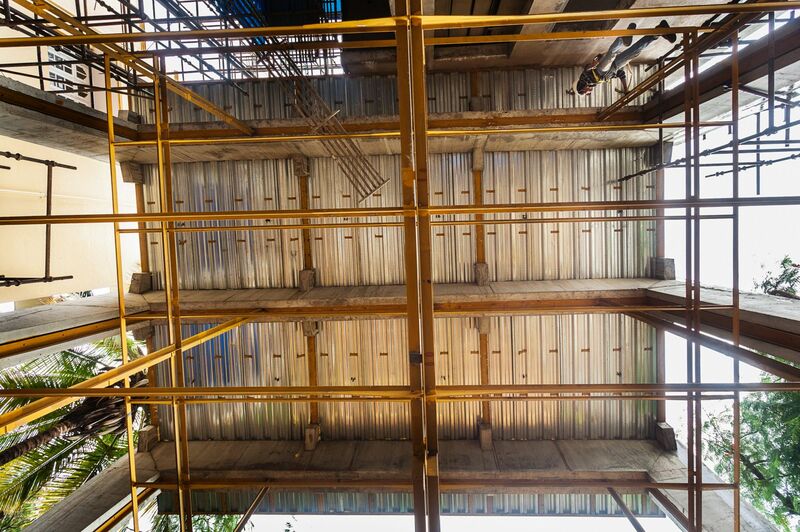 The material palate consists primarily of concrete, steel and wood. 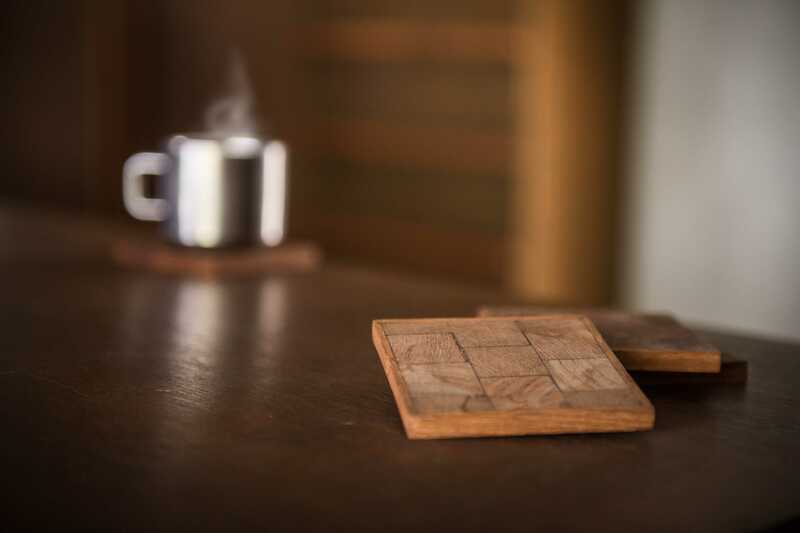 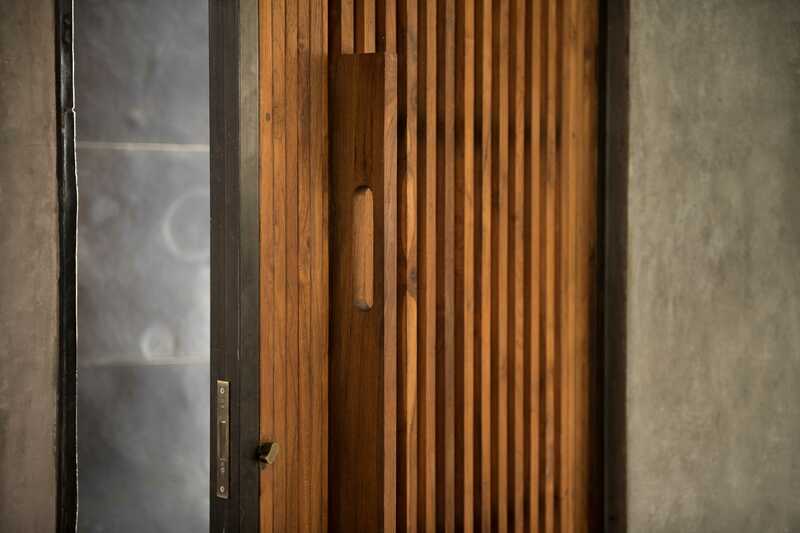 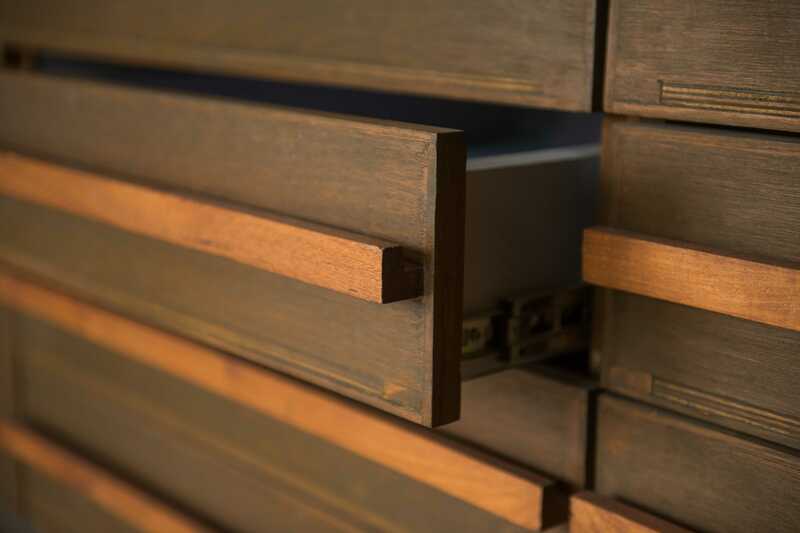 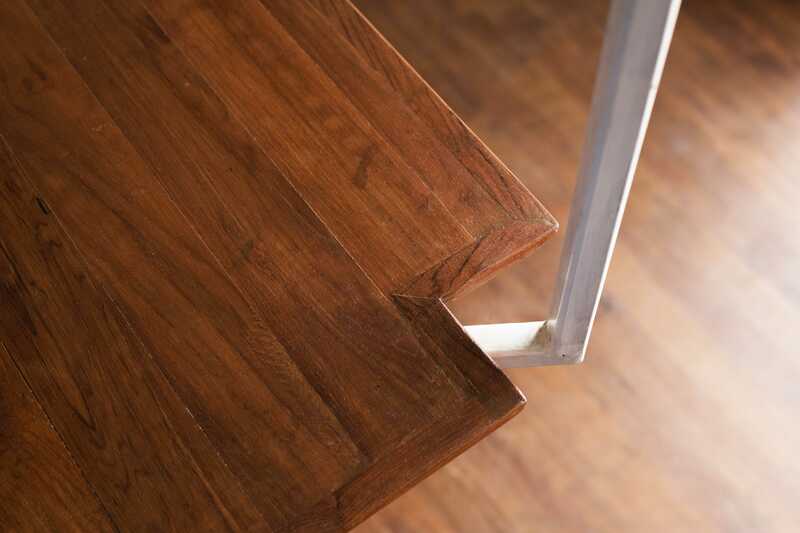 The use of recycled teak wood sourced from old demolished houses and the organic earthy finish of the concrete portals left in their raw form, expresses skilled workmanship and an intuitive execution process with very basic formwork and resources. 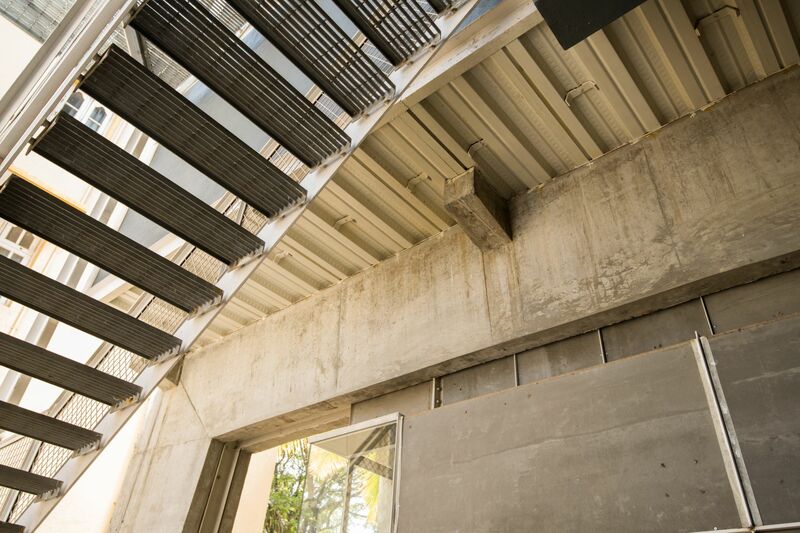 The white painted steel deck roof and structural member emanate a constant rhythm through the interior spaces. 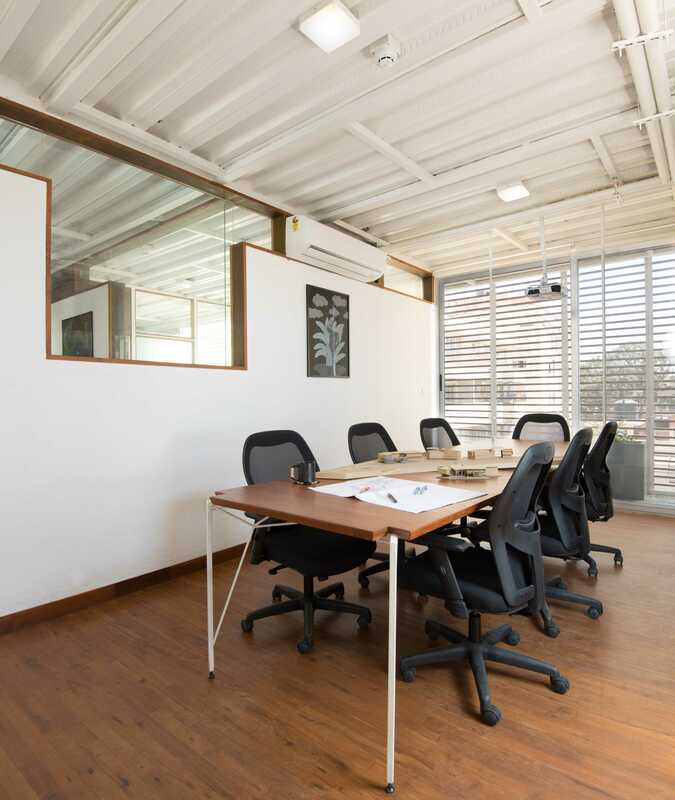 All the interior cabinetry and wall inner cladding are polished plywood .The flooring has been done using green kota stone in the studio and recycled wood in the meeting areas complimenting other natural materials.